Jennifer Van Horn opens her masterful work on the roles of objects in colonial British America by discussing a group of letters, deftly tying them to the mercantile world of their author, Francis Jones, and to the career of his portraitist, Joseph Blackburn. The introductory paragraphs are but one example of the author’s meshing of two- and three-dimensional objects and documents, deep reading in secondary literature, and extensive research that results in profound ideas about the roles of objects in culture. Van Horn’s analysis in The Power of Objects of the roles material culture played in port cities in North America and their ties to Britain represents a refreshing move beyond the equation of goods, especially rare or expensive ones, with status or other efforts to change political or social standing. The work links people and objects in different locations—from gravestones shipped from Boston to Charleston, South Carolina, to artists trained in England who worked in its American colonies. Focusing on cities of the Eastern Seaboard, the book, by design, makes few forays inland or beyond the transatlantic British empire. Van Horn’s analyses center on elite-owned objects and the behavior around their use, blending the tools, methods, and perspectives of the historian, art historian, and material culture scholar. Copious, well-chosen and -placed illustrations enable the reader to visualize the connections the author makes. The first chapter, on gravestones, is a particularly strong addition to the scholarship on the subject. Van Horn provides a deft discussion of the portraits that adorn a group of Charleston gravestones imported from Boston, likening their roles to those of portrait miniatures and noting their subjects’ New England connections. There is an excellent summary of the preparation of the body and burial practices that reflects the author’s deep immersion in wide-ranging period and secondary sources. The footnotes here and elsewhere sometimes cover a third of a page or more, perhaps the requirement of a publisher of traditionally historical works, and may seem a bit excessive to some readers. The notes, however, are meaty and relevant. The chapter on long port views is both thorough and astute. Like the literature on colonial portraiture, scholarship on maps is extensive, sometimes conflicting, and rife with discussions of particulars and new discoveries. Van Horn has fully digested this material and spins out important ideas about how maps influenced the viewing and interpreting of urban spaces during the colonial period. These comprehensive views were shaped by those who drew them with precision, but not spatial accuracy, in order to convey the urbanity of colonial cities, as well as those who printed them in different scales for American and British audiences. Her discussion of the impact of George Heap’s “surveyor’s gaze” on his Philadelphia view is particularly riveting and relevant to discussions of mapmakers and their audiences (47). The context for John Wollaston’s paintings are masterfully interpreted in subsequent chapters. Embedded in the discussion is a thorough grounding in painting scholarship—Van Horn has seen the works, accurately determined that they are indeed by the artist, and conducted in-depth research on each likeness. Such efforts are to be commended, as the history of colonial portraiture is messy—the field is filled with overly generous attributions, heavy-handed restorations, and confusion about what was painted in England versus America. She has waded through this quagmire, found the solid scholarship, and pushed it significantly further through her research and insights. These include, in chapter three, a thorough study of painting in colonial Philadelphia from the vantage points of artists, painters, sitters, and viewers. She further contextualizes this work with discussions of the broader art world, including other arts and publications in the colonies and Britain. The fifth chapter analyzes women’s dressing furniture in Charleston and New York City. A study of the roles of elaborate, compartmentalized, and often mirrored dressing tables is integrated with a discussion of the more ephemeral cosmetics with which women masked imperfections. These objects and activities contributed to what was seen as a risky tension between inner virtue and outer appearance at a moment of uncertainty regarding women’s roles in the early republic. As in previous chapters, the author provides thick descriptions of the objects and behaviors under scrutiny. Gouverneur Morris’s wooden leg is the subject of the final chapter. There is much value to subjecting historic wooden objects to the same scrutiny and methods as the highest-end furniture. The author discusses the relevant history of prostheses and their ubiquity following wars. Van Horn also notes that Morris wore the American-made leg abroad, signaling his participation in the American Revolution. The chapter is insightful, yet one has to wonder—were we not in the midst of an efflorescence in disability studies—whether this chapter would have found a place in the book. Although The Power of Objects is the author’s first book, it reads like the work of a seasoned scholar. In addition to perceptive ideas, deep research, and reading of artifacts noted above, nuanced positioning and summation of the work of other historians and art historians to date contribute to its value. 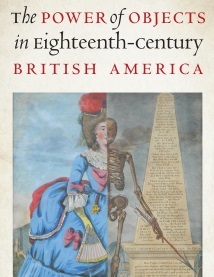 Surprising is the relative absence of reference to material culture scholarship, particularly its behavioral or anthropological branches, that might have further buttressed some of the author’s claims for the roles of objects in society.2 The author also misses an opportunity to contextualize the roles of British-made goods, particularly portraits, in some elite colonial homes. But these are very minor quibbles about a magnificent work of scholarship, as the author is unusually deft in her blending of the roles of objects (including paintings) in society. This work represents some of the best of material culture scholarship, blending new information and ideas that are stretched to thought-provoking but not always documentable observations. It is a delight to see truly novel analyses and interpretations of objects. The chapters are well integrated, yet each one can stand on its own as a reading in an advanced undergraduate or graduate class in a subject-based or methods course. There is much value to medium-specific explorations in a place-based historical context, particularly when done so thoroughly. The Power of Objects provides one model for resuscitating decorative arts scholarship, particularly for the colonial era. Although the limited data for the period makes topics such as how groups of objects worked (and were put to work) challenging, one hopes that this book will spur other scholars, particularly of the decorative arts, to pursue such topics. 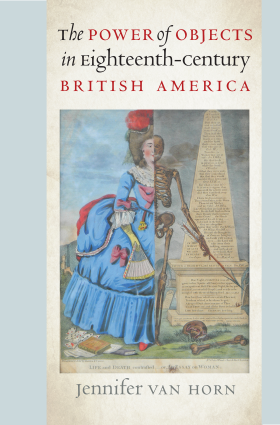 Cite this article: Anne Verplanck, review of The Power of Objects in Eighteenth-Century British America by Jennifer Van Horn, Panorama: Journal of the Association of Historians of American Art 4, no. 1 (Spring 2018), https://doi.org/10.24926/24716839.1641. About the Author(s): Anne Verplanck is Associate Professor of American Studies at Pennsylvania State University, Harrisburg.